In other words: what line must the train of history be carried along in order for the stability of humanity to be guaranteed? … can his analysis, made in 1939, shed any light on our human condition eighty years later? Heidegger claimed that we are moving ‘In a twofold direction,’ adding: ‘that is already prefigured in the essence of man,’ by which he means, by our relationship to other people and things. However, we would now add that the situation has become so grave that the ‘daring’ attitude has become the dangerously daring one which maintains the status quo, whereas the act of creating a goal above itself and its history would be one of simple good-sense. The positive view that Heidegger’s logic shows us, is that the direction towards a higher goal is no more difficult than the pursuit of the status quo: it is all just a matter of accordance. To go either way, the same procedure has to be followed – we have to be able to count on each other. In either case, we must think ahead ‘to a horizon that contains directives and rules in accordance with which what throngs towards us is caught and secured.’ To go forward unto a Utopia, is no different to creating the Dystopia that promises to arise if we maintain the status quo. Whichever way we go, the choice must be made by establishing a process of accordance. 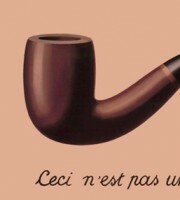 According to Heidegger/Nietzschean logic: ‘Representing beings and thinking rationally are the praxis of life, the primordial securing of permanence for itself,’ and in order to secure permanence today, humanity has to move in a direction that goes above and beyond the status quo that we have today. In order for survival to be guaranteed, a doctrine of permanence needs to be accorded; a doctrine that can replace the internecine doctrine of constant, economic growth that currently drives the status-quo, and which threatens rather than guarantees safety and survival. Perhaps we should not victimise the universities, the same can be said of our entire nihilistic culture, nevertheless, the idea that a university lacks a reason for learning is a tremendously sad one. The crippling result of the lack of purposiveness allows societies to throw in their own self-interested crutches: the university becomes a simple place to prepare people for the work-force, or, on a more hopeful level, an environment that will stimulate creativity. But if there is no purpose or reason, why be creative? In fact, how can one be creative when nothing matters? Or the opposite is true: it’s very easy to be creative when nothing matters – too easy. Either way, the result will always be a crisis of creativity. Baudrillard regarded Romanticism as the first great manifestation of nihilism; the destroyer of the order of appearances. The second great manifestation came through Dada, Surrealism, the Absurd, and political nihilism – corresponding to the destruction of the order of meaning. But, destruction is inevitable when appearances and meanings themselves are devoid of substance; when they are castles made of sand. It wasn’t the Romantics or Dada that destroyed meaning; they were merely realisations that meaninglessness had evolved around them. The real destroyers were those in the institutions themselves, trying to maintain a system which made no sense. Such a condition can only be perpetuated by dissimulation, and only whilst society swallows the performance in the staging of an ersatz purpose that the system offers them. Once the society grows tired of the theatrics played out before them they will start to yawn, or grimace if they are injured by it, and through that yawn or grimace they will see through the stage-craft to the emptiness behind it. When this happens on a massive scale, real revolution or a brutal reaction can take place. This awareness is happening today, it has been bubbling for some years, but the train is turning toward the Dystopia rather than any purposive Utopia. Buadrillard observed a similar scenario in the student revolts of Paris, 1968. Why didn’t a revolution happen then? Why is a purposive revolution unlikely to happen now? In other words, we are enchanted and enamoured by the same media that is strangling us and numbing our brains. We love to see the violence and perversion that the society produces so much that we would probably fall into a kind of spiritual crisis if the brutality of the system was taken away from us. Man is in the world … And if this is true for humanity, we need also to remind ourselves of it whenever we examine societies and our civilisation. Civilisation is only realistic when it is perceived within the context of the world – or, in other words, within its ecological context. Nevertheless, democracies largely ignore their relationship to the environment and give precedence, time and time again, to their own self-made fantasy-reality that it calls ‘the economy’. Civilisation has always been a challenge to the natural world; an audacious move by human beings to harness nature for our own ends in order to create a mode of existence that is superior to nature itself. But what Civilisation has gained by developing beyond the in-the-world context, it has also had to sacrifice its authenticity. It has become a fantasy form of its own potentialities, manifested in the madness of the economic doctrine of perpetual growth. For authenticity to be returned to civilisation, there needs to be a re-establishment of partnership with the world, rather than a continuation of conquests of land-spaces and a pillage of non-renewable resources. We are driving a juggernaut along a road which leads directly to a cliff edge. If we go straight, we will topple into an abyss. To avoid this, we have two choices: we can either turn left toward a Utopia, or right into a Dystopia. Given this scenario, why is it so hard to decide which way to go? Driving forward the way we are, will only bring about deeper and deeper systemic crises. Technological advancement has to create more automation and the digitalisation and robotisation of societies, combined with the continual increases in population density, can only further decimate jobs. Concentration of wealth and the centralisation of job opportunities to the growing megacities will continually draw desperate, poverty stricken outsiders to those centres. The easiest solutions are the Dystopic ones: the erection of walls to keep the immigrant invaders out. Ties between capitalism and zombie invasion metaphors have been made over and over again by many bloggers[i] and intellectuals like Slavoj Zizek[ii]. In the Brexit, we’ve been able to witness how easily a society can be swayed toward a Dystopic solution. When the outside world is too frightening to face, then the safest thing to do, say the Dystopics, is to retreat and gather together in a fortress with walls that are strong enough to withstand the encroaching invasion. The idea of the Brexit is to allow Britain – probably in a diminished form from what it is now – to do its business with the world in a safe position, removed from the very chaos that that ‘business’ has created and will continue to create. Essentially, the Brexit is riddled by the paradox inherent in all Dystopic solutions. The Dystopian is terrified by our world, but, instead of trying to imagine that world as a better place, it continues throwing more fuel into the motor of the chaos that scares it so much. In a sense, we have the capitalist Doctor Frankenstein hiding himself from his plague of monsters, but it doesn’t mean he wants to eradicate the plague. Quite the contrary, his retreat is merely a tactical one, in order to observe his beasts from a safe place: behind the walls that are heavily guarded, and with special forces that will occasionally venture forth to stir up the chaos even more. Utopic vision, on the other hand, embraces our world, and looks for ways of turning technological advances into a working alternative that offers an immensely better world – primarily much better because it promises a long-term survival for humanity in this world. Of all human problems, ultimately, the greatest problem of all is our mortality. One day we will die. Add to this the ancient notion supported by modern physics that the Universe is headed toward an inevitable annihilation, and we find that humanity is subjected to and conditioned by a tremendous pessimism. Everything must come to an absolute end. Any will to permanence is an illusion. Vanity of vanities. The more sensitive ones: the artists, the sensualists, the hedonists, call out Why? They all have a longing for permanence. “This is good and should not end,” is the optimistic attitude. And yet no-one, and nothing, can escape it. From the dismay this causes come the religions who promise the eternity that reality denies us. The message of religion is essentially that the dictatorship of death can only be transcended through the faith in the idea of another reality – the authentic reality which is permanent. But the faith does not change the material reality, in fact it needs its pessimistic inevitability to justify itself. However positive faith in the afterlife is, it ultimately creates a pessimism here on Earth. In fact, religious hope for the eternal in the transcendental creates a nihilistic attitude. It was a blind faith in the absolute afterlife, the Paradise of the monotheisms, that created nihilism, not the turning away from that faith. Once the objective became to get to the Paradise, real reasons for living here on Earth were no longer important. The only thing that mattered was Absolution or Providence. The idea that humanity itself through a manipulation of the physics of reality, could prolong life expectations and control nature through understanding, were condemned as ideas that came from the Dark Side. A dark, magical side that eventually evolved into science, which offered enough illumination to return human faith to itself again. Perhaps the most positive idea we can have at the moment is that there is no limit to what the magic of science could achieve. Perhaps eventually humanity could become immortal and even the dying Universe itself could be resuscitated by our most advanced science and technologies. The authentic world is here, and we are tiny in it, although our minds enlarge us. But the positive idea can only be truly positive if it is seen as a possibility. 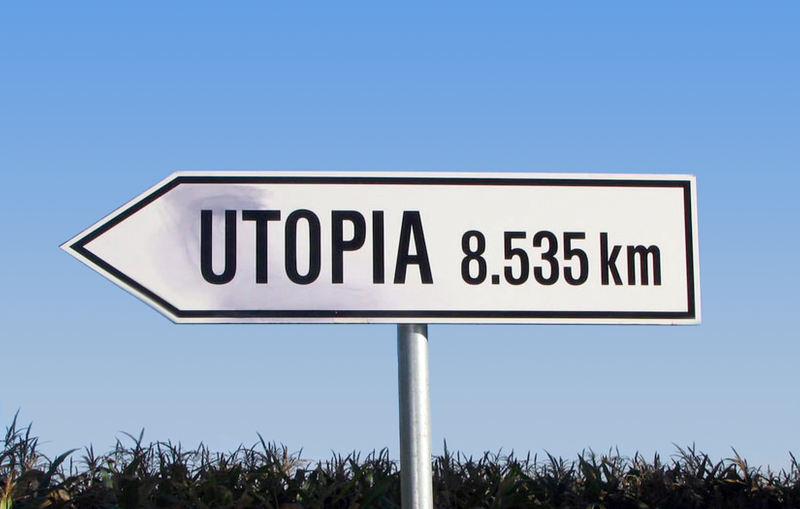 The most likely future for humanity is the dystopian version and positive thinking and action have to be a contemplation of how to escape the Dystopia and arrive at the Utopia. Or to get away from the process of becoming Dystopia and more into the process of becoming Utopia.